Designed for a lifetime of use, the eco-friendly Ceramic Green Cookware Set. Orgreenic 10 piece Set. 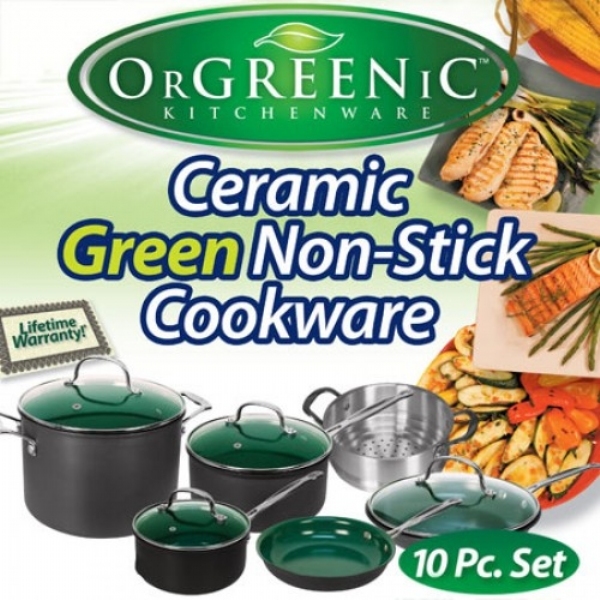 Designed for a lifetime of use, the eco-friendly Orgreenic™ 10 piece Cookware Set, as seen on TV, has an aluminum core and revolutionary non-stick, non-toxic (contains no harmful PFOA and PTFE) ceramic coating that lets you broil, bake, braise, steam, saute, fry or sear foods without the need for oil, fat or grease. Ergonomically designed handle stays cool to the touch. Won&apos;t chip, peel or wear. Aluminum alloy. Cooking made easy with the Orgreenic 10 pc. Set. Orgreenic 10 piece Set includes: 8" fry pan, 10" fry pan with lid, 1.5 qt. sauce pot with lid, 2.5 qt. sauce pot with lid, 6 qt. sauce pot with lid and aluminum steamer insert. This cookware is great! We really enjoy using all the pieces! I&apos;m so glad you had it available as I was looking forward to purchasing this. I have been using a single pan for a year now. It has gotten some scratches because the kids are careless with it, however, it is still non stick and still my favorite pan. Those that say they had their eggs stick...well, you have to know how to cook an egg in the first place. It works every time. I love it so much, I bought the whole set today. We bought our first Orgreenic fry pans at local drug store that also handles As seen on TV items and had to get the whole set.It all works great. think this is the easyest fry pan I&apos;ve ever to clean up. heats very even, and everything slides out just as you see on TV.